Yogurt is a slightly fermented food filled with healthy bacteria. Traditionally, yogurt is made from animal milk. However, you can find lots of plant-based yogurts too, including coconut yogurt. Like other fermented foods, coconut yogurt is good for your gut. Coconut yogurt is usually made from fermented coconut milk. This food is essentially a plant-based yogurt that's usually made without animal milk. This makes it ideal for people following vegan or paleo diets or people who are intolerant of other plant-based products, like soy. Coconut yogurt is lactose and casein free, naturally creamy and naturally sweet. It's possible to make your own coconut yogurt or obtain it in a supermarket. You should be aware that some coconut yogurts may use animal products, like gelatin or cow's milk. This means that they may be called coconut yogurt but may actually be a mixture of coconut milk and milk from animal sources. Also, don't confuse coconut-flavored yogurt for coconut yogurt. Such products are not made from coconut milk; they are likely just regular cow's milk-based yogurt or soy yogurt sweetened with coconut flavoring. Coconut yogurt is typically made from coconut milk , starch and live cultures. You can easily find unsweetened and sweetened versions of this product, as well as flavored types. Many supermarket products are fortified with additional vitamins, like B-complex vitamins and vitamin D.
A 100-gram serving of coconut yogurt has 1.2 grams of protein and 2.9 grams of fat, the majority of which is saturated fat. It also contains 12.9 grams of carbohydrates, 5.3 grams of which are fiber. Commercially produced coconut yogurt doesn't contain that many nutrients compared to other coconut-based products, like coconut milk or cream. Homemade coconut yogurt is therefore more likely to have a richer nutrient content. Cultured coconut yogurt has health benefits, as it's a probiotic-rich food packed with good bacteria that can support your digestive system. The bacteria in coconut yogurt are usually Lactobacillus bacteria, like Lactobacillus acidophilus, Lactobacillus casei and Lactobacillus rhamnosus. Other healthy bacteria, like Bifidobacterium bifidum and Streptococcus thermophilus, are also often present. There are a variety of benefits associated with the consumption of coconut, but most of these are typically related to eating coconut oil or coconut milk. Since coconut yogurt lacks most of the nutritional benefits contained in other coconut products, like raw coconut, milk and cream, its main benefits are related to the fermentation process used to make it. As a probiotic-rich food, coconut yogurt can improve the health of your gastrointestinal microbiome. Your microbiome is important as it influences a lot of different aspects of your health — from your personality to more obviously related digestive system issues, like irritable bowel syndrome. Your gut microbiome can also affect your immune system and central nervous system. Your gastrointestinal system and brain are actually directly linked via a cranial nerve known as the vagus nerve. The vagus nerve is capable of sensing the types of microbes in your digestive system's microbiome, which in turn influences your health. 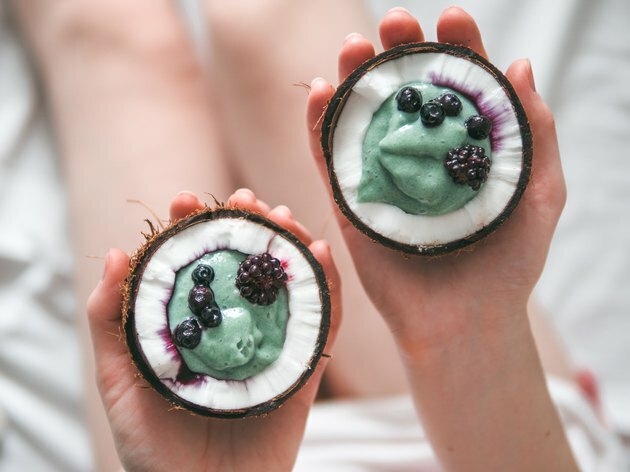 Coconut yogurt is usually perceived as equivalent to yogurt made from animal-produced skim milk, making it ideal for people who are keen on avoiding animal-based products. However, if you're able to consume animal-based milk products, adding small amounts of coconut to animal-milk based yogurt has been shown to increase its probiotic content. This means that coconut yogurt can even benefit people who typically consume animal products. The regular yogurt you'll usually find in a supermarket is typically made from cow's milk. However, this fermented product can be made from virtually any animal's milk. Other popular animal-based yogurts are made from the milk of goats, sheep, camels, yaks and buffaloes. Greek yogurt has 9 grams of protein and 4 grams of carbohydrates, none of which come from fiber. It also has 5 grams of fat, half of which come from saturated fat. This means that its amount of saturated fat is actually similar to that of coconut yogurt. The average unsweetened yogurt, such as Greek yogurt, has less carbohydrate and more nutrients than the equivalent commercially produced coconut yogurt product. This makes it better at reducing blood glucose compared to plant-based products. Soy yogurt also has small amounts (between 1 and 4 percent) of various other nutrients, like vitamin A, vitamin B9 (folate) and various minerals. It also has 1.7 grams of carbohydrates, the same 1.7 grams of fat and 2.9 grams of protein, which means it has more protein and less fat and carbohydrates compared to coconut yogurt.